When deciding how much space you need for pigs, take the size of the pigs into consideration. When planning space, keep in mind that smaller spaces tend to require more work on your part to keep clean. Many pig housing requirements are determined for pigs in intensive living situations, but just because pigs can survive in a small space doesn’t mean you can’t give them more room if you have it available. If you’re going to raise a couple of piglets to sell or to put in the freezer, they will weigh about 40 to 50 pounds when you first get them. These little pigs don’t need as much room to start with as they eventually will, and you can get by with putting them in a very small pen. Provide smaller pigs with a minimum of 4 to 24 square feet per pig until they reach 100 pounds. Keep growing pigs where they have enough room to move around, lie down and stretch out, and to eliminate waste away from where they eat. The University of Pennsylvania School of Veterinary Medicine says a 250-pound pig can live in as little as 9 square feet, while information from the U.S. Department of Health and Human Services indicates that pigs of this size should have at least 60 square feet of space. Your pigs will generally do better if you’re able to give them enough space to be comfortable -- it also means less cleaning for you. Pigs love to live outside, and if you have the space you can let your pigs loose in a pasture or lot of almost any size. The University of Florida Extension suggests providing 100 square feet per pig if your soil is sandy and well-drained, but increasing the amount to 200 or even 250 square feet if the soil is heavy and has a lot of clay. The University of Arkansas recommends providing pigs on pasture with even more space, allowing up to 800 square feet each. 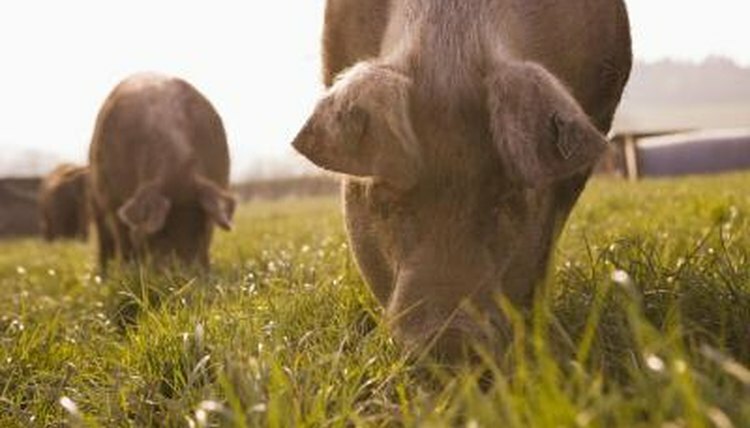 When keeping pigs on pasture it’s also important to maintain the pasture so that there’s grass and other vegetation growing for the pigs. Some breeds of pigs can grow quite large, easily topping 500 pounds. If you want to keep pigs for breeding you’ll need to take this into account and provide adequate space for these very large animals. The University of Pennsylvania School of Veterinary Medicine recommends a minimum of 10 square feet per pig for those over 250 pounds. In a well-drained lot with sandy soil pigs this size need a pen with a minimum size of 10-feet-by-10-feet each. Keeping large pigs on pasture gives them room to roam; the University of Arkansas Extension suggests providing pigs on pasture a minimum of 400 square feet each. What Do You Want in a Show Pig?